Should Internet Access be a Right? Internet access has become a mainstay of our society and arguably more important to staying informed and the ability to make a living than phone or television. It's something that can be taken for granted when living in a densely populated city, but many rural areas are left with spotty or non-existent broadband service. For software developers in particular this can make working remotely and offering after-hours support difficult or even impossible. I'm all for capitalism and a competitive market and I understand that most utility/service companies are out to make a profit so providing service to new areas is something they have to consider carefully, however when it comes to regional services these companies often have a monopoly that discourages new competitors and leaves residents with limited choices, and sometimes no choice at all. That's one reason why companies are often required to sign franchise agreements with city, county or state where they agree to provide a certain level of service in exchange for their territory. For example, Comcast signed a franchise agreement with Franklin County (TN) which states they will, "provide Cable Service to every dwelling unit wtihin the Franchise Area reaching the minimum density of at least twenty-five (25) dwelling units per mile". To put this in perspective, if you split one square mile up into equal lots then each resident would have approximately 25 acres. This means that they have committed to providing service to all but the most rural and sparsely populated areas. One important point regarding this agreement is that it only addresses Cable Service, which is defined as, "(A) the one-way transmission to Customers of (i) video programming, or (ii) other programming service, and (B) Customer interaction, if any, which is required fo rthe selection or use of such video programming or other programming service." While it makes sense they would offer additional services once the company has invested in running lines out to new areas, they have no commitment to providing internet access. Does the area you live in have a franchise agreement with local internet service providers? 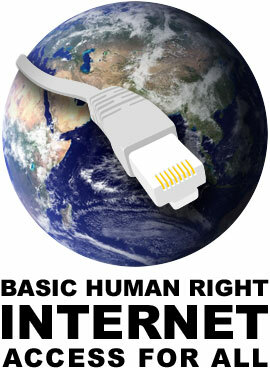 Do you think that internet access is something they should be required to provide to residents or is it a luxury?